These scenes are all very close to one another. Basically I just turned around from where I had drawn the “Summer Cottage” drawing in Chapter 17. 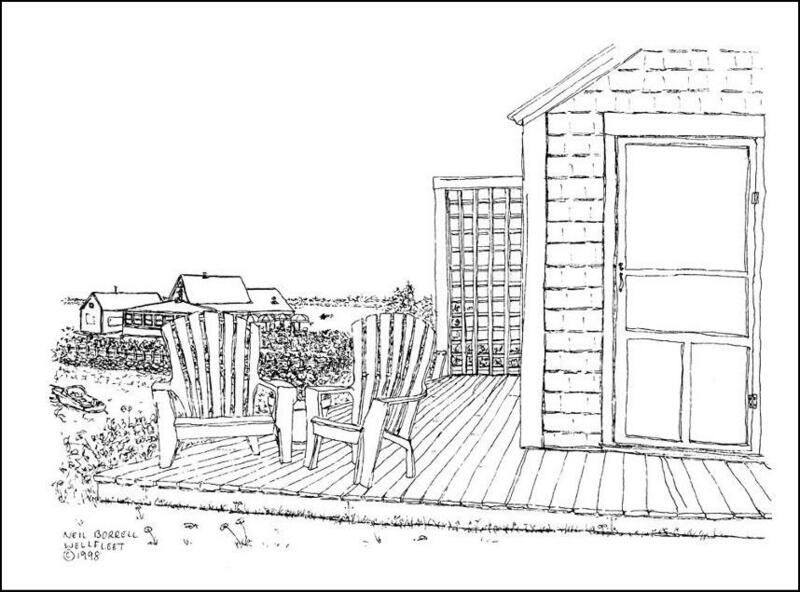 I had done the drawing without the chairs at the same time as the summer cottage drawing but liked the one with the porch which is the subject of Chapter 17 better. 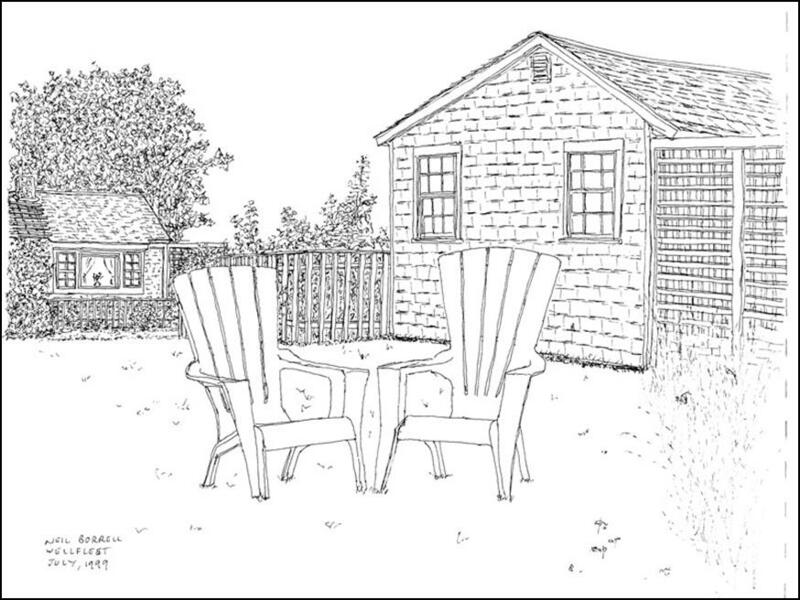 The next time we were in Wellfleet I drew the cottage next door with two chairs in the foreground to continue the chair theme. 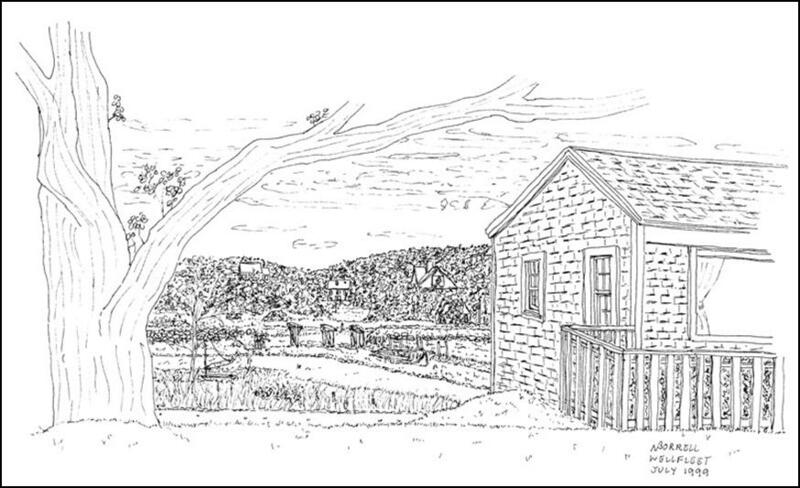 The drawing framed by the tree and cottage was really boring. It was just two chairs and the side of a house. I love simple drawings but they need to be interesting and I don’t think this one is. 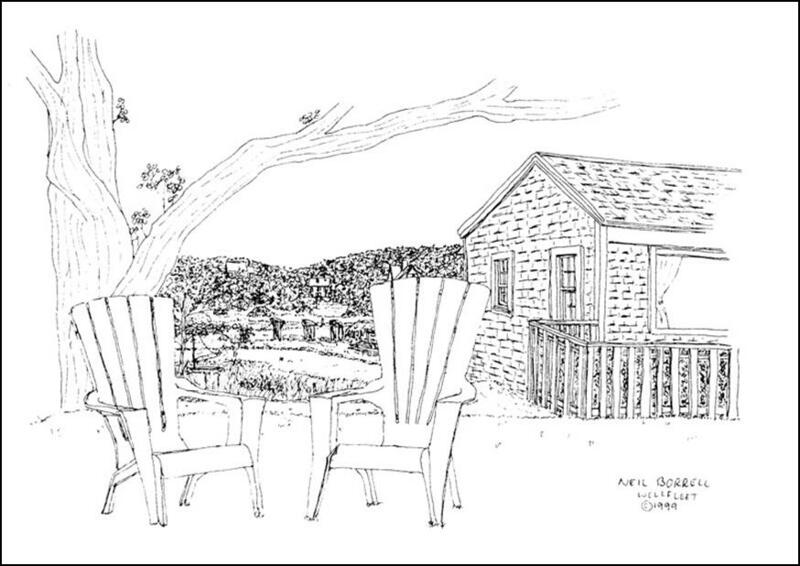 I liked the stuff in the distance in the drawing with the tree and I liked the cottage but not the tree. It looks like a Halloween card to me. I decided to cut the chairs out of one and paste them into the other. I had made the chair slats closer together so I didn’t have to fill in little bits in the spaces. The background is Duck Creek which is very shallow and drains almost totally at low tide. 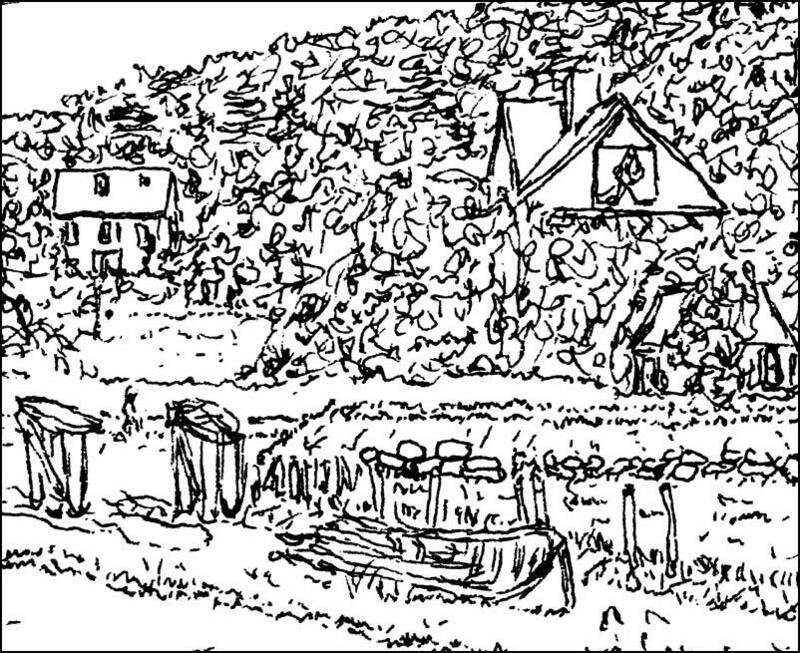 A hundred or so years ago this was deep enough to be the commercial harbor of Wellfleet. It silted over and eventually the railroad bridge cut it in two. We once rented a place on the other side of the Town Pier and would walk into Wellfleet along the beach in the background. We rented over there partially to have a beach pretty much to ourselves. The first day there was a bluefish feeding frenzy. The bluefish bite at whatever they come across. When it was over the beach was littered with hundreds of fish with bites taken out. We went back to the town beaches. I placed the chairs here thinking it would be a nice summery scene but I think it ends up leaving you wanting to see what there is that makes this more than just a place to sit in the sun. 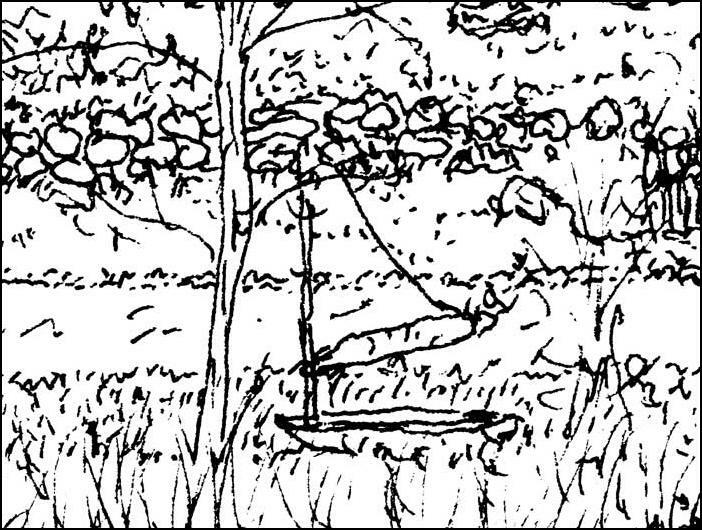 I liked the drawing below because it showed Duck Creek with some derelict boats and the remains of a railroad bridge. I still thought it needed more and I’ve always been unhappy with the tree. So I cut the chairs out of the first drawing and pasted them into the second. This makes me think that there must be a great view from sitting in the chairs if they’re faced away from such a nice view.